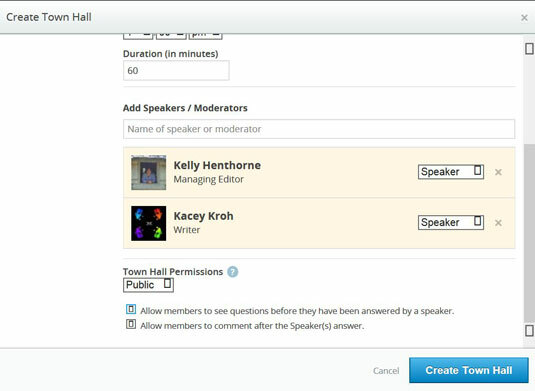 What Is a Socialcast Town Hall? 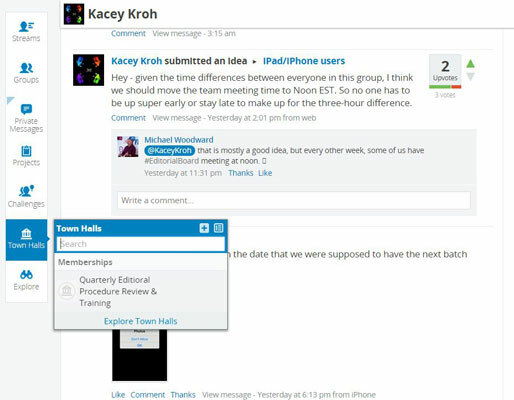 A Socialcast Town Hall is the 21st Century version of the traditional quarterly meeting. You know the scene: all the corporate executives are flown in from wherever their offices are to talk for 10 minutes each about last quarter’s revenues and next quarter’s goals. Then an employee asks a question for clarification about the new personal leave policy, which had nothing to do with the presentation. After the dog-and-pony show, everyone stands around at chest-high cocktail tables and munches on chocolate chip cookies and lemon bars and talk about Super Bowl commercials while the door prizes are given away — one more trick to lure people in to a mandatory meeting at least 20 percent still manage to blow off. A Socialcast Town Hall isn’t like that at all. Instead, it’s more like a company-wide live chat session — one you can prepare for in advance and revisit at any time. Generally, a Town Hall is used by management to communicate important information to the entire company and solicit questions and feedback about the information presented. Who participates in a Socialcast Town Hall? Administrator: The Town Hall administrator is responsible for the technical aspects of the meeting. 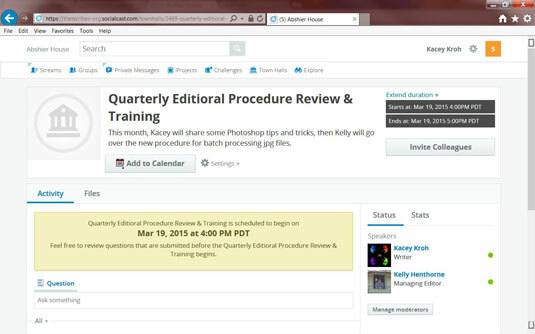 The administrator creates and schedules the event in Socialcast and manages its operations during the actual meeting. Speaker(s): The speaker is the person making the presentation. The presentation can be prerecorded as an audio or video file and posted as a link or download when the Town Hall is scheduled, or you can do the presentation via a live-streaming link (if your company has that capability) or by typing it all out during the meeting. Moderator(s): The moderator manages the flow of the actual meeting so the speakers don’t have to, monitoring questions and comments from the attendees and passing them on to the speaker to answer next. The moderator is also the timekeeper and generally serves as the host or emcee of the event. Attendees: (Hopefully always plural; otherwise, what’s the point?) These are all the people in the audience, listening/watching the action unfold onscreen, asking questions, and so on. 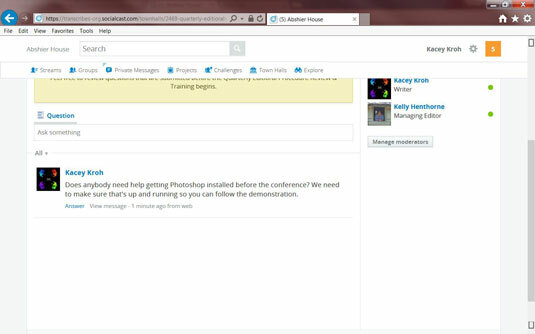 If you’re the meeting convener (administrator), you’ll be happy to know that by default, an announcement regarding a public Town Hall is posted on the Company stream, which goes to everyone in the company. You don’t have to go to the trouble of sending every single email address an invitation unless you change the permissions to Private, meaning invitation-only. Remember, this interaction is live, but without audio or video. Think cluster chat. Speakers (“typers”) who are presenting should prepare ahead. It takes a lot longer to type 250 error-free words than it does to speak them! During the presentation period, don’t make the attendees wait long periods of time while you type and expose yourself to potentially embarrassing errors. There will be plenty of time for that during the question and answer period. And on that note, you can post the entire presentation ahead of time and allow attendees to post their questions ahead of time as well, giving you time to prepare a well-thought out and researched answer. If you do that, be sure to state clearly in the first line of the Town Hall description that the file(s) attached should be viewed before the meeting. Otherwise, there will be a lot of chaos. It probably would help to send a reminder a few times before the meeting as well. Busy people forget to do preparation homework and, thus, spend half the meeting trying to catch up. When it is time for the meeting, you can either follow the link in your calendar event or email (if you received one), or you can click on the event in the Town Hall Directory to jump into the room.